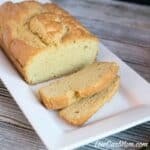 With green bean carbs being low, they are a great vegetable for a low carb diet. Try them in this hamburger green stir fry skillet recipe. We always have a lot of venison in our freezer. I’ve thought about joining my husband in hunting, but I don’t think I could ever get myself to shoot an animal. It used to bother me a lot in the beginning since I didn’t grow up with hunting. I still remember the first time I had deer meat. It was very difficult for me to eat as I couldn’t get past the visions of Bambi and the fact that a wild animal had been killed. After learning about how much better venison is than most commercially sold meats, I became thankful that I am fortunate to have plenty of deer to eat. We live at the back of an old farm which is surrounded by hundreds of wooded acres. Although I enjoy watching the deer that visit our yard, I know that these animals provide a healthy source of meat for my family. We process a lot of the venison into hamburger which tastes like extremely lean ground beef. The butcher does add some pork fat since the deer meat is so lean. This may be one of the reasons why I like the venison hamburger so much. I typically cook the ground hamburger meat at least once a week. Most of the time, I just brown it in garlic then add vegetables and soy sauce. A lot of people wonder about green bean carbs. There are roughly 7 total grams of carbs per cup with about 3.4 grams being fiber. 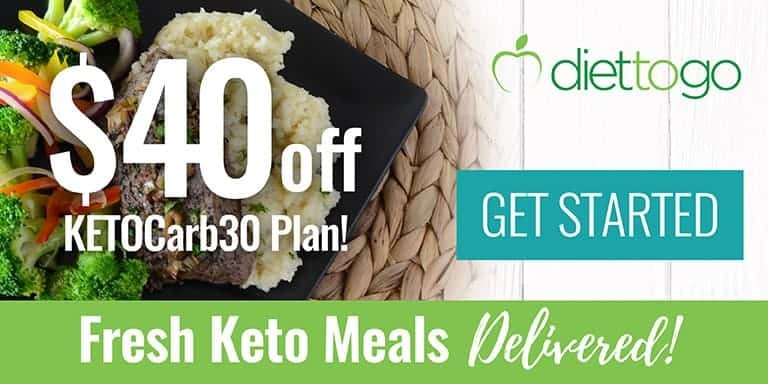 So, if you count net carbs, there’s only 3.6 net carbs per cup of green beans. That’s why is a vegetable that’s often served on our menu. It also helps that my husband loves them. Water chestnuts, on the other hand, are a bit higher in carbs. 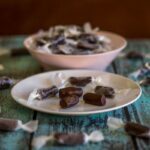 You may want to reduce or eliminate them in the recipe. They really aren’t needed anyway. In this recipe, I used a can of water chestnuts. The carb content didn’t appear too high on the label. However, when I started to search them online, they do have more carbs than other low carb vegetables. When you look at green bean carbs, it’s less than 2 grams net for a half cup serving. That’s why it’s one of my favorite vegetables to serve on the side. 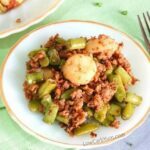 This hamburger green beans skillet stir fry is the perfect example of my easy to make venison dinner. It’s a really tasty dinner for busy weeknights. 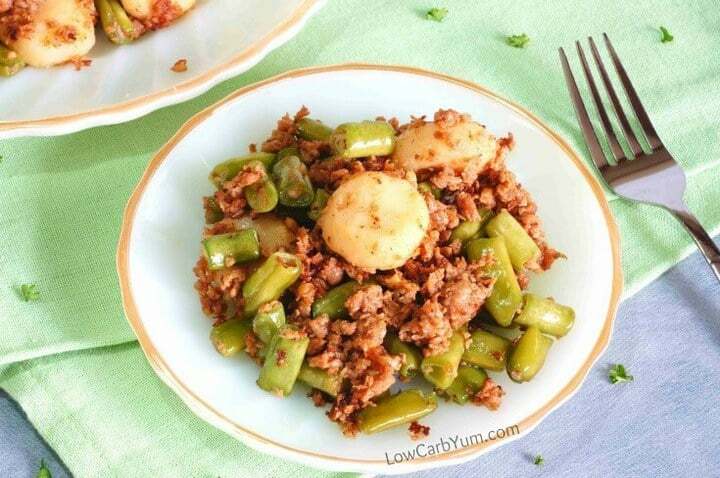 It’s so quick to make this easy hamburger green bean skillet stir fry. I just brown the meat in a little oil and garlic. Then I add whatever low carb veggies I have on hand. With the net green bean carbs being so low, you should definitely include them in your meal rotation. My youngest daughter eats them like french fries. I even created an oven fried green bean fries recipe. I’m going to try using sliced radishes next time in place of the water chestnuts. That will reduce the carb content. There’s about 15 carbs in a cup of water chestnuts so use them sparingly or leave them out. 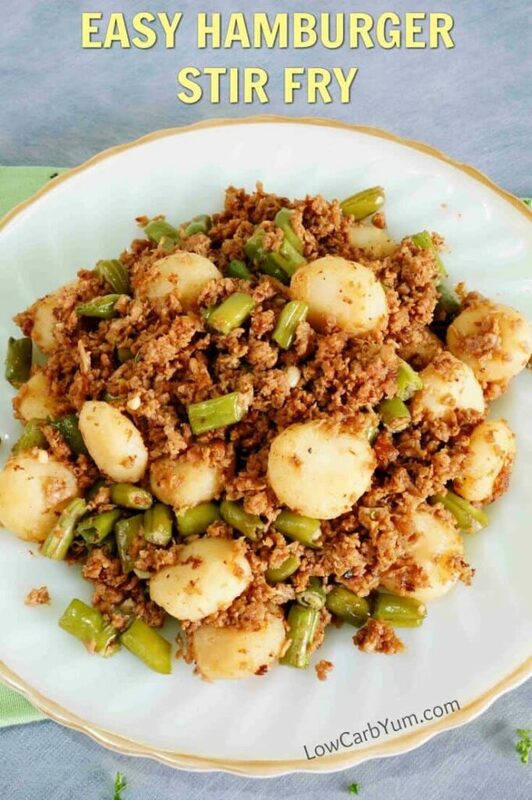 I chose to use green beans in this easy hamburger skillet stir fry dish. 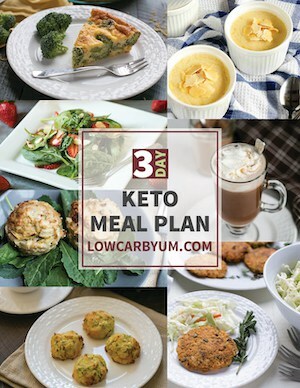 But, you can use any low carb vegetable. Broccoli and cauliflower florets would be good choices. If you like this recipe, I’ve got a few other hamburger skillet dishes that are just as easy to make. My Mexican Zucchini and Beef has been a super popular recipe. 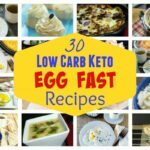 Crack slaw is also a quick dish that’s popular with those eating low carb. 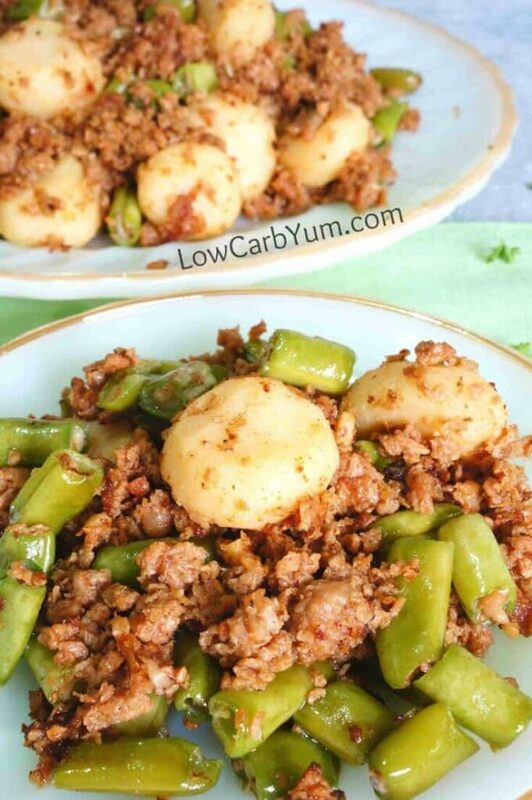 This low carb hamburger green bean skillet stir fry dish is so easy to make. And, it cooks up quickly on busy weeknights when you need dinner fast. Brown meat in skillet with garlic. 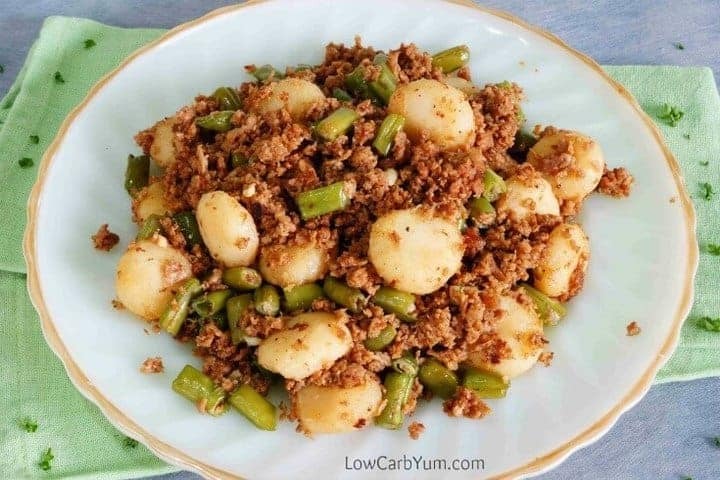 Add about 8 ounces of frozen green beans along with water chestnuts (these can add a bit more carbs). Sprinkle soy sauce to taste. Continue to cook and stir until heated through. 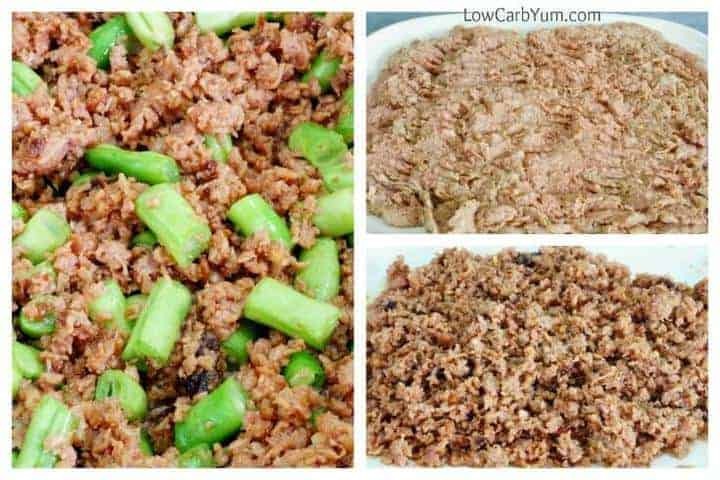 [post_content] => This low carb hamburger green bean skillet stir fry dish is so easy to make. And, it cooks up quickly on busy weeknights when you need dinner fast.